It’s fun and interesting to see patents – the originals behind the pens we love so much now. 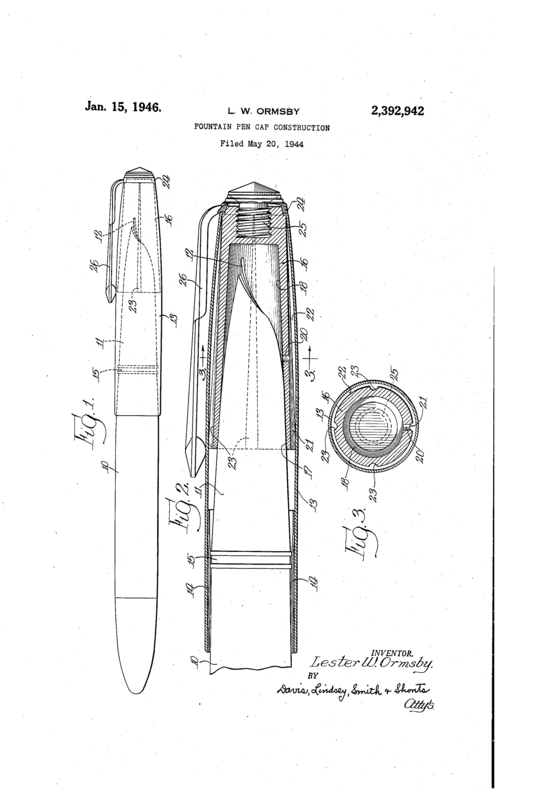 This patent was filed by Lester W. Ormsby, for The Parker Pen Company. Looking at the patent, one may recognize a Parker-like appearance about it. This was a novel cap construction to allow venting in the interior to maintain pressure, but without drying out the nib. U.S. Patent No. 2,392,942 (Issued January 15, 1946). This entry was posted in Vintage Pens and tagged Parker, Patents. Bookmark the permalink. Follow any comments here with the RSS feed for this post. Post a comment or leave a trackback: Trackback URL.